Dr. Deborah Brosnan is a marine scientist who brims with passion for learning about and protecting the oceans. In recent years, she has also turned her considerable scientific expertise to helping people and ecosystems cope with the destruction wrought by natural disasters. Her work has taken her into typhoons, under erupting volcanoes, through a terrifying plane crash and at ground zero of the Asian tsunami. Her experiences in Southeast Asia led her to found the Tsunami Reef Action Fund, which is working to restore human and natural systems severely battered by Mother Nature’s fury. A pioneering woman scuba diver, Brosnan has traveled around the world doing research and directing major conservation efforts, from restoring the Everglades to helping set up marine reserves. She has helped inject sound, science-based reasoning into national debates and has testified as an expert on endangered species and ocean issues before Congress. An upbeat speaker, Brosnan communicates in words everyone can understand. She grew up in Ireland and earned her Ph.D in marine ecology from Oregon State University. She co-chaired the National Science and Policy Forum. E Magazine: Through your work you’ve spent considerable time working in the aftermath of the Asian tsunami disaster, which resulted in catastrophic loss of human life and property. But what Americans rarely hear about is the damage that was also done to marine life. Can you give us a sense of what was lost? Deborah Brosnan: The underwater devastation was patchy. If you saw the images of the wave coming in, you could see how it destroyed stuff and then pulled it out with it. Well, all that stuff pretty much landed on coral reefs. In one area 92 to 325 million cubic feet of debris ended up on reefs and the sea floor. I saw everything from refrigerators to furniture to an entire house on reefs, and that stuff rolls around and smashes the coral up into bits. Corals grow about a quarter of an inch a year, so reefs are anywhere from 100 to about 1,000 years old, with the really pretty ones being older. In Southeast Asia the reefs are among the most diverse in the world and they literally support hundreds of millions of people by providing food and an economic base. What is the Tsunami Reef Action Fund doing to help people sustainably harvest the reefs? We target areas where people depended on reefs for fishing or diving, and we try to provide income for those people, because so many have completely lost their income. I’ve never been anywhere where I’ve seen so much devastation—hundreds and hundreds of miles at a stretch. Many of these communities literally have nothing now. Before the tsunami they had incomes, often fairly modest incomes. Now, so many live in camps on the beach with little food or source of income. We are targeting some of these communities that are trying to get back on their feet by helping local people clean up the reefs, and reestablish a relationship with the sea, because that relationship got pretty damaged. A lot of people are more afraid of the ocean now, and we try to help them reestablish a relationship with the ocean and learn to care for it. If someone doesn’t step in and help, are you afraid the reefs will be even more threatened by masses of hungry, desperate people now crowded onto disaster-struck beaches? Yes, that is one concern. Eighty percent of the reefs in Southeast Asia were already under serious threat before the tsunami. Reefs that were already damaged by dynamite fishing, for instance, were more vulnerable, so when the tsunami came through it further destroyed them. This reduced the total reef area, so now you have people dependent on a smaller area of reef. There is fear that unless we step in to provide alternatives, not only will we go back to business as usual, but it will be worse. What have been some of your successes through the fund? 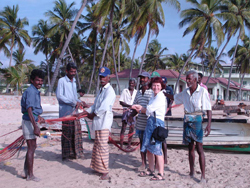 I spent some time on the east coast of Sri Lanka working with a group of fishermen, who used to harvest the sea before the tsunami by blowing up reefs with dynamite. They hadn’t known anything else, and I was the first scientist they had ever met. They helped clean up the reefs, and we got to talking. They saw for themselves how the reefs had protected the land, whereas where they had dynamited the coast was completely demolished by the tsunami. They also realized that there were no more fish to catch at the dynamited areas. They then went to local authorities and asked for help in enforcing a ban on dynamite fishing, because they were afraid of destroying their own futures. Did those former dynamite fishers realize how slow coral grows? No, they didn’t know. They were up front with me and said, "This is what we’ve always done, and if we don’t do it someone else will." At first, when we began to talk about what their kids would do, they had no idea how important the reefs were and how difficult they were to clean up. They helped take a net off the coral that was a couple of miles long, which the tsunami had tangled around it, strangling fish and turtles. That’s really hard work! They got a sense of how fragile the system was, and how important. They had relied on it for food and resources, but didn’t know how quickly it grew or how the whole system fit together because no one ever told them. You have said one of the reasons why you’ve done so much work in Southeast Asia is because you were on a plane en route to Los Angeles that crashed there. Many passengers died and you were given an award by the Red Cross for your heroism in helping others through the disaster. You have said the people and oceans helped you tremendously. What did you mean by that? It was a pretty horrific crash, really. I was on a 747 taking off in Indonesia, heading back from a reef conference. It was during a typhoon, and the pilot thought he had turned onto the runway. But he hadn"t, he had turned onto a taxiway, with construction at the end. We missed the take off and hit the construction, maybe 100 to 200 feet in the air. A fuel tank ruptured and the entire plane blew up. I was covered in jet fuel and got out of there with the skin on my teeth. The interesting thing was people who didn’t know me began showing up at the hospital. People would show up with just things you needed. They showed up with money so I could buy food, and clothes. I didn’t have a pair of shoes. A group of monks came with packets for people. I wanted to give something back in the same way. Also, the ocean showed up for me because after the horrific scenes from the crash I couldn’t sleep. I had to do something, so I filled up the bathtub and got in until I was completely underwater. I would close my eyes and go back to this reef I had dived on the day before I got on the plane. I think I would have gone completely nuts if I wasn’t able to do that. You have had very personal experiences with disaster—with the crash and also your work in Montserrat moving a coral reef to protect it while a volcano was erupting. How does this inform your ability to help others with disaster preparedness and with studying the effects of these catastrophic events around the world? ce has had a huge impact on my understanding of how ecosystems are shaped by natural disasters and how in turn the ecosystems effect our lives. Having witnessed many of these disasters and seeing how we respond as a species has taught me much about what you can and cannot do to help. There are some communities who will be in shock for longer, and there is not much you can do at that stage. Other communities really need to get back on their feet, and you can help them develop a stronger relationship with their environment and rebuild and reshape their lives in different ways, maybe ways that are more sustainable. It’s pretty clear now that reefs protect coasts, as do mangroves and sand dunes—just look at what happened on the U.S. Gulf Coast, for example. Do you think people are getting the message about the importance of wise coastal development? I don’t think everybody is getting the message, I really don"t, and that is distressing to say the least. People especially aren’t getting the message in the developing world, where they are most vulnerable. Many people on the ground are responding in ways that are not sustainable because they’ve got no choice. I have been to the Gulf Coast since Katrina, where a lot of the issues are the same as I saw in Southeast Asia. The devastation isn’t as huge, but it’s very serious in some areas and people are responding in the same ways. I think it’s clear that some of our activities, such as putting channels through the mangroves, made the disaster worse because we created funnels for the storm surge. Do you think that knowledge is going to translate into better coastal management down on the Gulf? I think that unless we make a very strong, concerted effort to do things differently, that what will happen is exactly what happened before. We may do some little cosmetic things, but what we need to do is take a very different approach. We need to get our scientists, economists and the communities together and recognize that we do need to protect the environment. But people are also going to live there, and fish there, and that instead of taking a piecemeal approach we really need to hammer out how are we going to sustain our environment for the long term. What needs to be done sounds like the work you are doing with the Sustainable Ecosystems Institute, which tries to plug scientists into public decision making. Do you agree with the scientists who complain that their profession has become more politicized than in past years, and is that a problem? You’ve talked a lot about the need to reconnect communities with science. How do we do that? That’s what I hope to get to, and the way to do it is to make science relative to people’s lives. We’ve made science into something that often people don’t understand. Science is a process, and it provides us with great information we can use to cure diseases or protect ourselves against hurricanes. What science cannot do is to tell you that a politician is right. People also tend to think of science as this awful physics class they had to take. But you don’t need a Ph.D. to use scientific information, because everyone is connected to science and the environment. Science can be a community process. For example, we’re working to get recreational divers involved with reef restoration. Given the impending realities of global warming and associated sea level rise, a lot of scientists have predicted doom for many of the world’s surviving coral reefs. Then again, critics counter that so much of climate science seems uncertain. How do you explain such complexities to the average person? What I say is don’t be confused by the fact that data are still coming in. Don’t throw it out and say, "This scientist says that but another says this." The main message is the one that you want to listen to, and that is our environment is really suffering and changing, at a very fast rate. Whether that means two inches or four at this point is irrelevant, because the message is that it is changing, and the consequences for us and our kids are going to be enormous. Once you grasp that, then it is a matter of what you do with it. You have to look at yourself, see what skills you have, and get involved. How hopeful are you that we will still have reefs in 200 years? I am worried about what is happening to reefs because I have seen many of the changes, yet I’ve also seen what a difference people can make when they decide that they are going to take care of their environment. I helped set up a marine reserve 10 years ago in the Caribbean, at St. Bart"s. At first, there were hardly any fish there. Ten years later many fish have come back. People who hated the reserve in the beginning are now proud to have it. Also, protecting reefs, or any ecosystem, is like saving money for a rainy day. If we have a sufficiently large amount of ecosystems protected in reserves, species will be able to adjust to the inevitable changes that are heading our way. Reefs may be destroyed by a natural disaster or ships running aground, but if there are enough in reserves we’ve got enough to nurture the next generation of coral. What is it like to dive on some of these diverse reefs? The first thing that hits you is the incredible colors. Then you are struck by an amazing diversity of fish, both in terms of shape and color. They are floating around, doing their stuff like you’ve landed in a really cool party and everybody is having fun. You don’t always know what is going on, and it’s exciting, different and beautiful. There are beautiful, huge corals, like tall statues in a sculpture garden, and everything sways back and forth with the currents. It’s a total assault on your senses with movement, beauty and color. On a destroyed reef, there is too much sediment, making the only color gray. The entire reef might be turned upside down, or smashed to bits. There are far fewer fish and much less life. Brian C. Howard is an avid snorkeler and is Managing Editor of E.
Erin Coughlin provided editorial assistance. Tsunami Reef Action Fund, (503)869-5769, www.tsunamireefactionfund.org.